I’ve been banging on Apple’s newest iDevice since Friday morning, and I’m ready to offer my answer to this burning question: Should mobile filmmakers run screaming to the nearest Apple store to grab the new iPad? There. I just saved you the trouble of scrolling to the bottom of this post. You’re welcome. With that out of the way, let’s take a quick look at Cupertino’s latest offering. 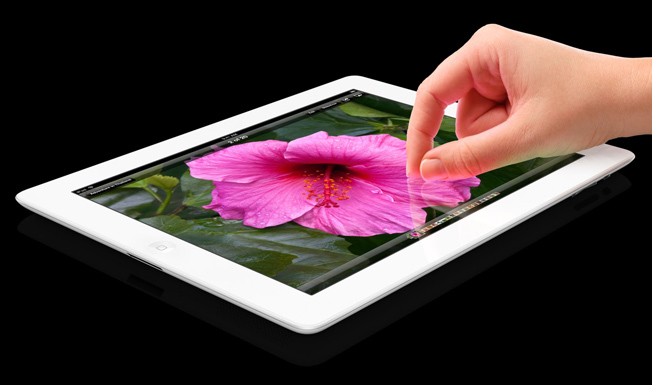 The most significant aspect of the upgrade is the iPad’s new Retina Display. It contains 4 times as many pixels as its predecessor, for a total resolution of 2048 x 1536. And, as you likely have just realized, that’s more pixels than you’ll find on that brand-new HDTV sitting in your screening room. Sick. Really. Sick. Powering this increased resolution is a new quad-core graphics processor. I could quote a bunch of specs, but the only way to appreciate this new display is to see it firsthand. It’s quite remarkable. As you would expect, HD video looks terrific on the new display–as does text. Frankly, I think I’m more excited about the text since video already looked pretty great on the iPad 1 & 2. The scripts I read on my new iPad this weekend weren’t any better than usual, but reading them was a far more pleasurable experience. I imagine writing with this new screen will rock in equal measure. 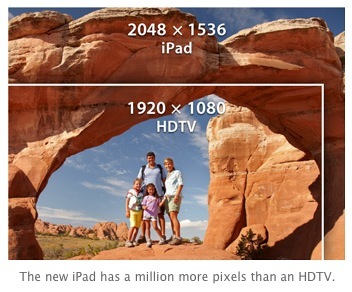 1080p HD, improved optics, and built-in image stabilization add up to a huge leap forward for tablet-based cameras. For me, the previous iPad didn’t hold any attraction as a video capture device. I used it only when nothing else was available –– so, twice maybe? The new iPad has changed that. The images are crisp, vibrant, and high-resolution. It’s no 5D, but it’s the best damn tablet camera you’re likely to see (and I don’t mean that in a bad way). When you combine the new 1080p HD camera with the new Retina display, you wind up with a very usable mobile video capture setup that can shoot, edit (Avid anyone?) and upload. It’s everything we love about the iPhone but with a much larger display, perfect for previewing focus and composition. As a result of this knockout combo, I believe we are going to see many more iPad camera accessories (mounts, grips, etc.) hitting the market. 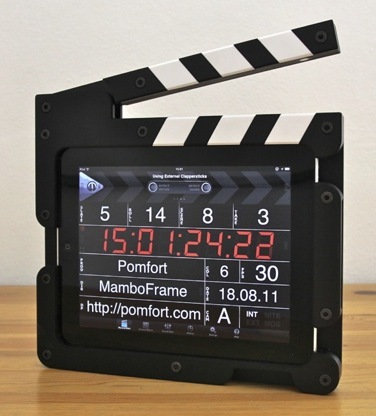 I’ve already seen some great homemade iPad rigs, but now the iPad finally has a video camera worth rigging! Yes, you are going to look silly shooting with your iPad. Accept it and consider this: It’s not about what people see while you’re shooting, it’s about what people see when you’re done. You can check out some sample video, along with an image stabilization demo on Apple’s website. I love using dictation software. I use Siri on my iPhone, and Dragon Dictate on my Mac (which I’m currently using to ‘write’ this article). I rely on it for everything from simple e-mails to full-blown screenplays. So naturally, I’m thrilled they’ve brought it to the iPad – especially since I’ve never really grown to love the on-screen keyboard. 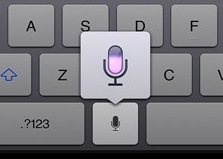 The new dictation tool can be called up from a small button located next to the spacebar, and it functions in much the same way as it does on the iPhone 4S – which means an internet connection is required. I’ve already used it to craft a quick project synopsis and it worked like a charm. It’s a bummer that Apple didn’t include Siri on their new iPad. AppAdvice has some interesting thoughts on the subject. I guess we’ll survive. As you would expect, the faster speed provided by Verizon’s 4G network means snappier video streaming, faster file downloads, and a less annoying web browsing experience. Overall, I was pretty surprised by the speed increase. I knew it would be faster, I just didn’t expect it to be fast. Seeing this extra speed got me excited for the future. Wouldn’t it be great if this extra throughput enabled your iPad (and soon, your iPhone) to wirelessly receive multiple, simultaneous streams of 1080p video? This new, higher speed limit, combined with the new quad-core graphics chip, is bound to bring some cool advances. Stay tuned. Even with the improvements they’ve made to the iPad, Apple has managed to keep the battery life at an impressive 10 hours-ish. 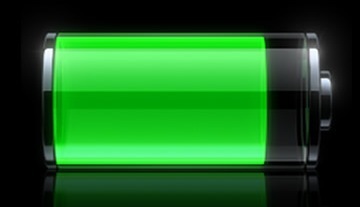 I didn’t run any scientific comparisons, but my battery seemed to drain at the same speed as my previous iPad. Not much more to say about that, except Hooray! Sure there are! For one, the new iPad is slightly thicker, rendering some of those expensive iPad 2 cases useless. The fabric ones should be fine, since the difference in thickness is VERY slight. However, hard cases may have some trouble. I’m happy to report that Pomfort’s 100% awesome MamboFrame easily accommodates the new iPad’s thickness (I’m hoping to post a full review of the MamboFrame sometime soon). Another con is… um… er… I’ll have to get back to you on that. As I said right up front, I think Apple’s latest iPad iteration is a very worthwhile upgrade for any mobile filmmaker. But, it is just an upgrade – and not a ‘must-have’ upgrade at that. It’s the same iPad you know and love, but now it has the deluxe trim kit with alloy wheels, a sports transmission, and an all-leather interior. Nothing better than that new iPad smell! Did you get the new iPad? What do you think? Share your thoughts in the comments!